In the heart of cosy, leafy, well-endowed Barnes, through the little villagey bit and right before the road veers off towards the Wetlands Center opposite the playing fields, lies a local café called Alma. From the front, it looks tasteful and inviting in a Farrow & Ball Victorian-conversion kind of way, with high chairs visible through the window signalling to the Barnes captive market that, yes, please do bring in the kids. And to a parent, hungry or not, what’s not to love about that? 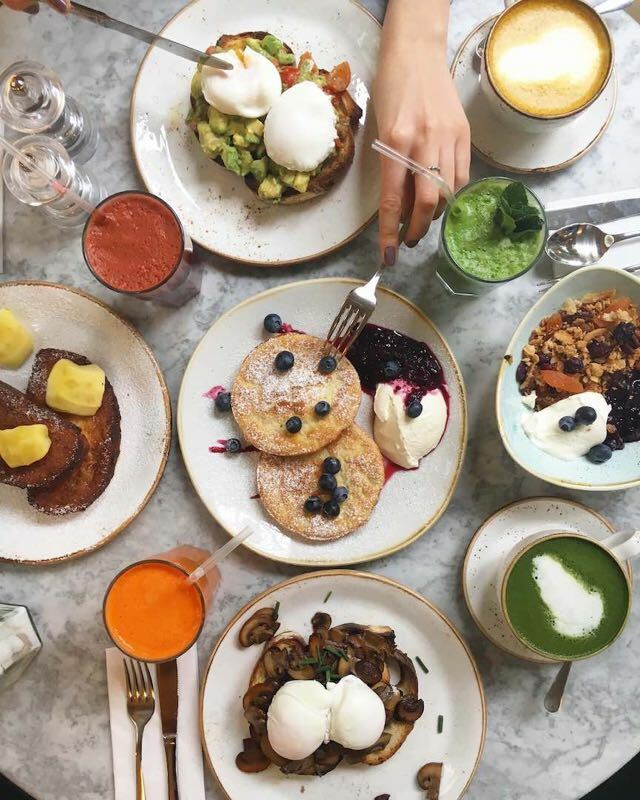 Full disclosure though - my husband and I trialed a massive brunch there to celebrate Alma’s first birthday and new menu – and chose not to take any of the kids, because sometimes you need to get through a meal without cutting up someone’s toast or wiping a smoothie from the floor. So we ate at Alma’s by ourselves and willfully ignored the full children’s menu, sat in amongst a few quiet mums and babies, grinning at each other like we really need to get out more. The space is full of natural light and stylish little details like potted succulents, hanging 70’s houseplants, New York tiles, deco-esque brass wall lights and where we sat, a little cushioned banquette tucked away in a corner – perfect for the parent who just wants to feed everyone without annoying anyone else. The café is much bigger than it looks from the outside: big enough to absorb buggies and small-person-chatter from those working on laptops, and offers communal tables, smaller spaces and seating for two. The counter is full of glorious multi-coloured salads in a fresh Middle Eastern Ottolenghi-style and as lunch took over from brunch, meat, fish and pasta dishes come out on display. Clearly freshly baked cakes and pastries flirted with me from where they sat on the counter, and would have been perfect to have post-brunch with a flat white, had I any room left. Crucially, on that point the Alma Café coffee house blend (and the barista) were both excellent. The menu is all-day brunch and lunches, and the focus is on food that is locally-produced, seasonal and certified organic. My husband went for the full English, and I, more modestly, ordered the avocado and feta on toast. I had heard that Alma’s do decent-sized portions, and this was an urban myth come true - both came out as massive old school hefty numbers, the kind of plateful you might get in a greasy spoon, but a whole lot nicer. My husband was quiet as he made his way through his, only baulking momentarily at the thick doorstop-sized portions of the wheat and rye sourdough toast which required quite a bit of effort to saw through. He loved it all, although reserved a special shout-out for the bacon. My brunch was a heaped, gorgeous avocado tower, brought to life by spritzes of lime and a crunchy hazelnut topping and drowning in a silken, salty feta and yoghurt sauce, crowned by a perfect poached egg. We chased this all down with another coffee and looked enviously at the lightshades. Whoever designed the interior of Alma’s knows how the neighbourhood wants to live, and how they want to eat. Next time, we’ll have a slice of the cake and maybe, though not definitely, might bring the kids.